How does it happen? How did something as innocuous as a drink or two after a long day at work morph into a full-blown health hazard? Alcohol is not, however, some inert, innocent substance. Instead, it has the potential, over time, to become a highly toxic danger to all aspects of one’s life, including physical health. So how does someone know when they have crossed the line into a serious alcohol use disorder? There are several signs of growing alcohol dependency, and among them are the declining health signs of alcoholism, which can act as an important wake-up call that it is time to get some help. Cardiovascular disease. Alcohol abuse over the long term can lead to heart attack, stroke, or blood clots. Cancer. Heavy drinking can lead to certain types of cancer, namely cancer of the esophagus, liver, colorectal region, mouth, throat, and larynx. Dementia. Alcohol addiction can speed the shrinkage of some regions of the brain leading to memory loss and dementia. It also impacts the executive functions, such as decision-making and judgment. Anemia. Alcoholism can reduce the number of red blood cells, leading to anemia and resulting in lightheadedness, fatigue, and shortness of breath. Cirrhosis. As mentioned above, alcohol addiction is toxic to the liver, leaving scars that impede its ability to function. Depression. Depression can be a result of alcoholism or the driving factor for becoming addicted to alcohol, but depression and alcoholism are a common dual diagnosis. Suicide rates are very high among alcoholics. Pancreatitis. Alcohol is very hard on the entire gastrointestinal tract, often causing gastritis and pancreatitis. What Are the Deteriorating Health Signs of Alcoholism? The signs of declining health often show up long before late stage alcoholism and the onset of the serious medical conditions listed above. There are early warning signs that point to toxicity and nutritional deficiency that usually appear first. These might include weight gain or loss, a distended abdomen, facial bloating, red eyes, sexual dysfunction, and gastric distress. Nutritional deficiencies, such as B-vitamins, thiamine deficiency, vitamin A and vitamin D deficiencies, are common among individuals who abuse alcohol for an extended period of time. These are caused because alcohol can impede the absorption of nutrients in the gut. Thiamine deficiency can lead to a degenerative brain disease called Wernicke-Korsakoff syndrome. Other nutritional deficiencies among heavy drinkers include zinc, iron, potassium, and magnesium deficiencies. When health issues begin to crop up, as well as hand tremors and withdrawal symptoms, the need for help becomes apparent. These are signs that the body is deteriorating and the alcohol addiction is becoming a serious health threat. Taking steps to get professional treatment for the disease is imperative at this juncture. When it is time to seek help for alcoholism, the following tips can help you or your loved one take those first steps toward recovery. Have a medical examination. A physical exam can lead to the doctor identifying overall health status through lab results that can offer information about liver function. The doctor can offer support and guide the individual toward seeking out an addiction treatment program. Check your health insurance benefits for treatment-related coverage so you can plan ahead, knowing what you are covered for and approximately what your out-of-pocket expenses might be. If employed, make preparations for taking a medical leave. Legally, you cannot lose your job due to the need for detoxification and addiction treatment. Make plans for work and family obligations. Make arrangements for someone to take care of a child, pets, or other tasks while you are in treatment. Family members should become educated on alcoholism and recovery, to prepare to be supportive once the treatment program is completed. What Does Alcohol Addiction Treatment Look Like? Alcohol recovery begins with the detox and withdrawal stage. The body must purge the toxins of alcohol from the body in order to clear the mind and stabilize physically and emotionally before entering treatment. Alcohol detox should only be undergone in a medically monitored environment where sometimes dangerous withdrawal symptoms can be adequately managed. The alcohol addiction treatment stage of recovery can last a month to a year, depending on the severity of the addiction. Most individuals spend 30-90 days in treatment, and the longer the better the outcome. Treatment consists of a variety of therapies and activities that work in tandem to help the individual change the addictive behaviors, as well as equip them with important recovery tools. Following completion of alcohol rehab, ongoing outpatient therapy and participation in a recovery community helps to solidify recovery and stave off relapse. Having a strong support system at home is also key in achieving a successful long-term recovery. Golf Drug Rehab is an elite alcohol treatment program based in Orange County, California. The most important focus in treatment and recovery is restoring overall health while learning how not to reflexively revert back to drinking behaviors. 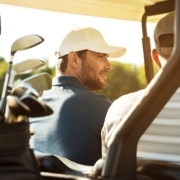 At Golf Drug Rehab, our mission is to create an individualized treatment strategy for each client, built upon the important information collected during the intake process. From this background data our clinical staff can build a tailored plan for detoxification and addiction treatment, helping clients rebuild their lives. Our clients also enjoy the golf-theme we have incorporated into the rehab program, providing golf rounds at local courses that help the client reconnect with the activities that bring them joy. Being outdoors and getting some exercise does wonders for one’s mood and outlook, which can aid in recovery efforts. If you would like more information on the health signs of alcoholism or more information about Golf Drug Rehab, please contact us today at (877) 958-5320. What is the Best Treatment for Alcoholism? Residential Drug Rehab for Men What is the Best Treatment for Alcoholism?